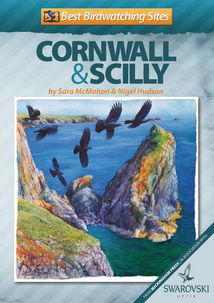 Author Sara McMahon, a long-time officer of the county bird club, provides detailed assessments of 52 key birding areas, ranging from established nature reserves such as RSPB Marazion Marsh to the western valleys, such as Cot Valley and Nanquidno, which provide a welcome refuge for exhausted vagrants from America and Siberia each autumn. Inland areas are well covered with detailed reports on reservoirs such as Drift and Stithians and moorland sites such as Golitha and Tamar Lakes, but it is the coastal locations which receive the greatest attention and Sara provides a complete guide to seawatching with details of species and sites, plus her fieldcraft tips based on hard-won experience. Scilly is famous for its incredible track record in turning up rare and interesting birds and many birders make an annual pilgrimage to these attractive islands each autumn. Nigel Hudson, secretary of the British Birds Rarity Committee, provides a detailed guide to each of the significant islands in the archipeligo, plus details of ferries and inter-island boats to ensure your visit is a great success. A Checklist of Birds compiled from lists maintained by the Isles of Scilly Bird Club and the Cornwall & Devon Bird Preservation Society. The birding year in Cornwall.